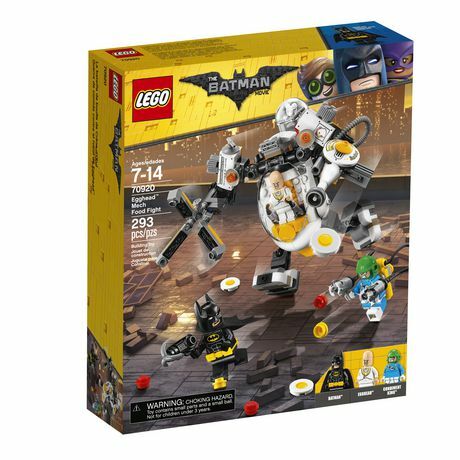 Help Batman(TM) fend off Egghead(TM) and Condiment King's food-firing attacks with LEGO The Batman Movie: Egghead Mech Food Fight set. The Egghead Mech features an opening egg-shaped mini-figure cockpit, posable arms and legs, a fried egg disc shooter, spinning and grabbing whisk/claw and a canister containing chicken and egg elements. Condiment King is armed with ketchup and mustard stud shooters. This LEGO Batman toy includes 3 mini-figures..